Umi-Hotaru (海ほたる), literary means the firefly of sea, is the artificial island in the middle of Tokyo Bay. It is the resting area located in the middle of Tokyo Bay Aqua-Line(東京湾アクアライン). 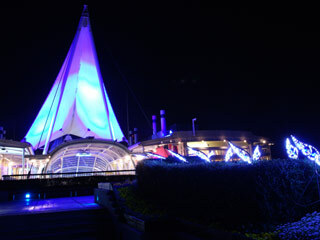 Umi-Hotaru is very popular night-scene spot where you can enjoy the great city light of Tokyo. Umihotaru itself also have many light-up demonstrations. For example, there is firefly light up at the north-west side of the island. There are many restaurants, gift shops and other entertainment facilities. Parking is free, but you have to pay the toll fee for Aqua-Line. There is a couple of shuttle bus at Kawasaki Station. Tokyo Bay Aqua-Line is one of the express-way which connects Kawasaki, Kanagawa and Kisarazu, Chiba. It is the crossing bay highway made by the underwater tunnel and the bridge. The tunnel called Aqua-Tunnel is 9.6km and starts from Kawasaki. The bridge called Aqua-Bridge is 4.4km and starts from Kisarazu. At the connection of the tunnel and the bridge, there is huge artificial island called Umi-Hotaru. The parking of Umi-Hotaru has about 450 car spaces. It was built in 1997. Toll fee is very expensive, but the car with ETC will be discounted 1,000 yen on the weekends. The usual fee for standard size of car will be 3,000 yen. It is very convenient for traveling Chiba Prefecture. It will take only about 1 hours from Tokyo to south part of Boso Peninsula which used to take couple of more hours.